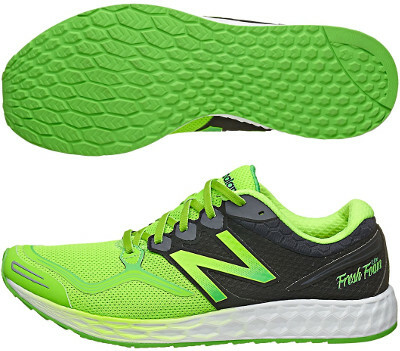 New Balance Fresh Foam Zante are neutral performance running shoes. The New Balance Fresh Foam Zante (also known as 1980) is the flagship of the second generation of Fresh Foam powered running shoes. It is lighter and more responsive than original 980 Fresh Foam which evolution has the codename Boracay. Most interesting part of the Fresh Foam Zante is definitely the one piece Fresh Foam Lite midsole foam. The optimal balance between cushioning and stability comes from how the hexagonal construction has been designed for related area featuring a smoother transition. Outsole from the original 980 Fresh Foam has been improved: better traction with redesigned lugs and enhanced integrity with crash pad just separated by a flex groove. The downside is that softer rubber raises several concerns regarding durability. Upper is based on a seamless breathable air mesh with fused synthetic overlays (FantomFit) strategically placed for better fit. The N logo is the biggest reflective element in order to enhance visibility under poor light conditions. No tongue slide Full internal sleeve with no friction at all make Fresh Foam Zante suitable for barefoot running. New Balance tends to release limited editions related to big races, so there is one Fresh Foam Zante NYC available out there. As a curiosity, the Fresh Foam Zante has been awarded Competitor Magazine's 2015 Road Shoe of the Year.